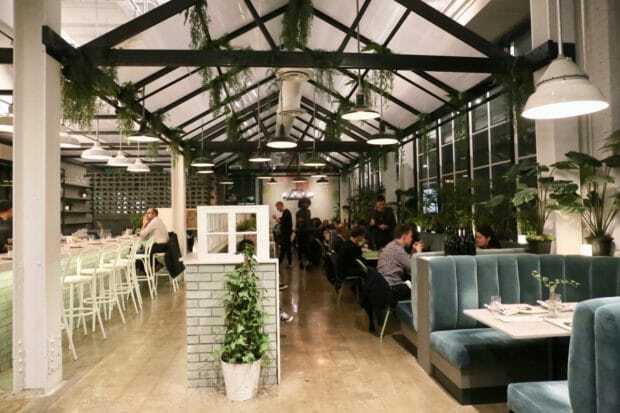 Rosalinda Toronto opened its doors in May 2018 in the heart of the city’s entertainment district. The restaurant sits perched over Richmond Street West, a stones throw from the Sheraton Hotel, Four Seasons Performing Arts Centre and Toronto City Hall. 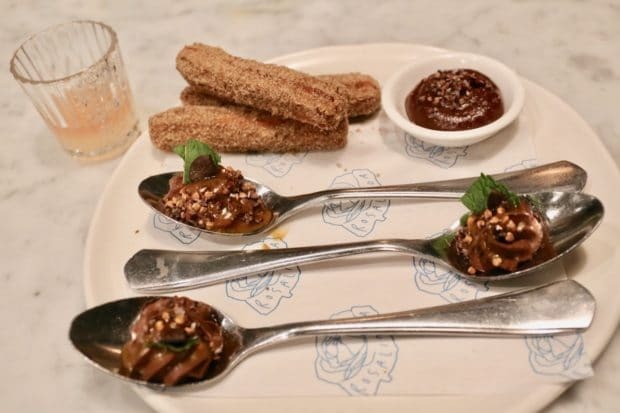 Rosalinda is Toronto’s first vegan Mexican concept, the brainchild of restauranteurs Jamie Cook (Pizzeria Libretto), Max Rimaldi (Enoteca Sociale) and Grant van Gameren (Bar Isabel, Bar Raval, El Rey, PrettyUgly, Tennessee Tavern). 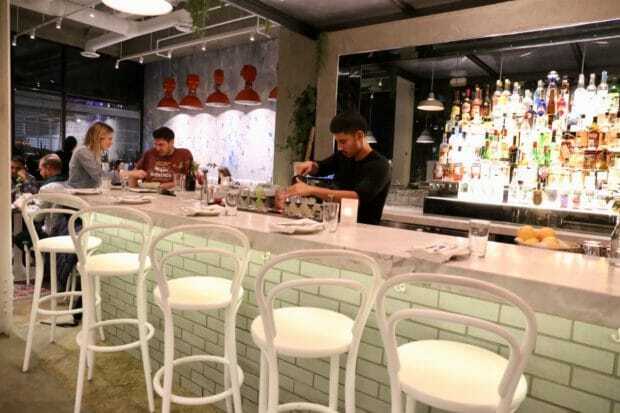 Skip through Rosalinda’s front doors and you’ll discover a design-tastic 138-seat restaurant. The interior feels like a chic industrial garden, where sun splashes through overhead windows and lush plants offer a lively green accent. 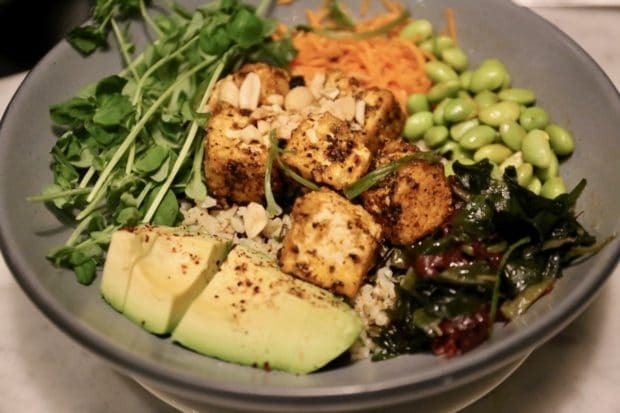 The fresh vibe makes it one of the most popular vegan restaurants in Toronto. 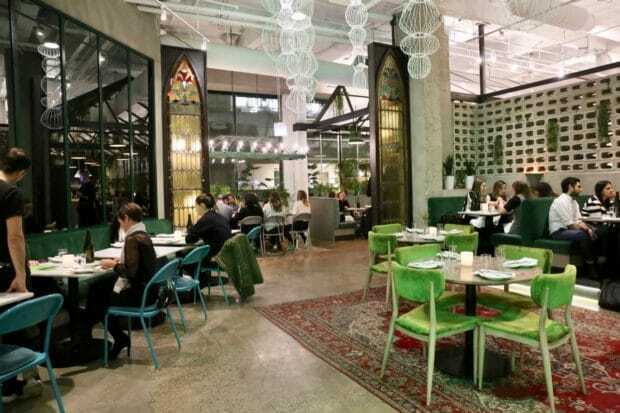 The interiors at Rosalinda Toronto were designed by Brenda Bent and Karen Gable. The eight-foot vintage stained-glass church doors offer a sense fo history to the contemporary dining room. Adding a hat tip to old meets new. The instagram-worthy custom overhead greenhouse structure gives visitors the magical feeling that they are dining al fresco. In the dining room you’ll find industrial concrete floors paired with sleek custom banquettes. Salvaged rose and teal chairs were given a makeover with comfy velvet seated adorned with rose motifs. Be sure to pay a visit to Rosalinda’s bathroom. It’s my favourite space in the place. 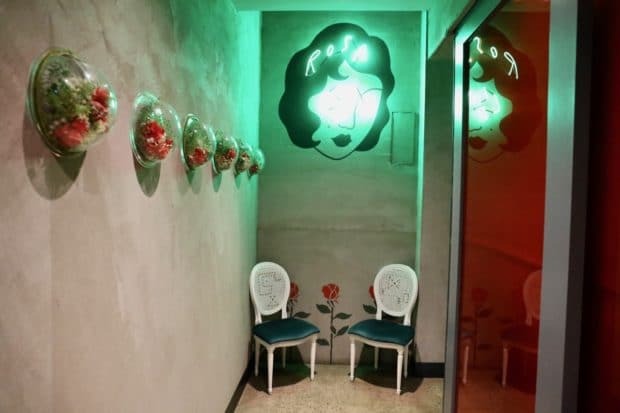 A neon Rosalinda sign is greeted by a parade of glass domes which play home to eye-popping florals. There’s a distinct contemporary art world edge to the decidedly bohemian restaurant interior. Craft cocktail fans looking to indulge in luxurious libations should pay a visit to resident mixologist Owen Walker. Unique mezcal flights and shaken tequila tipples are what make the bar menu stand out. Walker is also on trend with the no and low alcohol movement. His Placebo cocktail offering help Rosalinda stand out to other vegan restaurants in Toronto. His complex tipples are spiked with Seedlip, the world’s first distilled non-alcoholic spirit. Rosalinda Toronto’s drinks menu will also make beer and wine fans giddy with glee. Craft beer and cider pairs perfectly with spicy Mexican dishes. You’ll find rotating taps as well as faves from Burdock, Bellwoods, Collective Arts, and Fairweather breweries. Wine lovers are spoilt for choice as Rosalinda’s well curated list features bubbly, white, rose, and red bottles from Bot River, South Africa to our very own Twenty Mile Bench in Beamsville, Ontario. 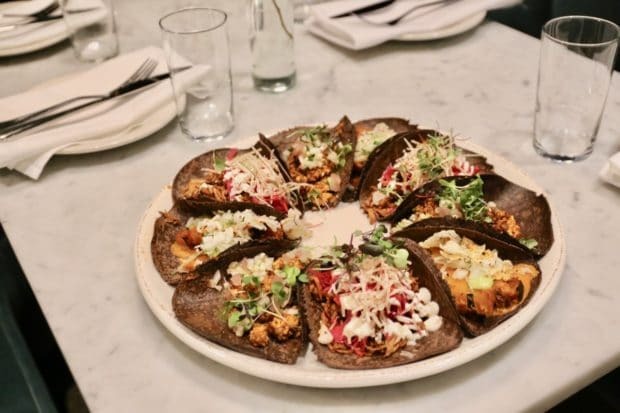 Ask a vegetarian in Toronto and they’ll without a doubt chirp “Rosalinda is the best Mexican restaurant in Toronto.” The restaurant’s menu was created by Executive Chefs Kate Chomyshyn and Julio Guajardo. You can also find the duo working their culinary magic at Grant van Gameren’s El Rey and Quetzal. 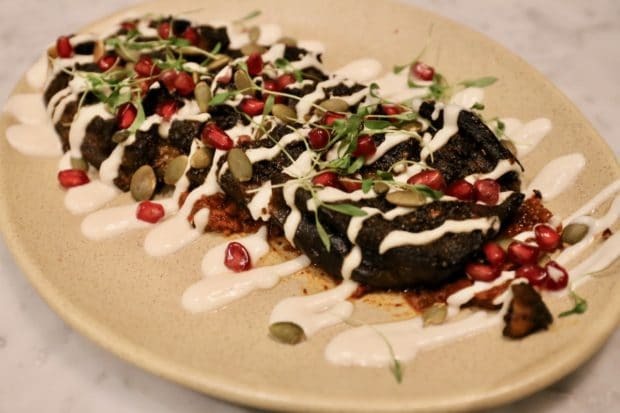 Their vegan Mexican menu celebrates the best of Mexico and Baja California, featuring big and bold flavours. Rosaburger: black bean patty, smoked eggplant chips, iceberg, avocado salsa and chipotle mayo. 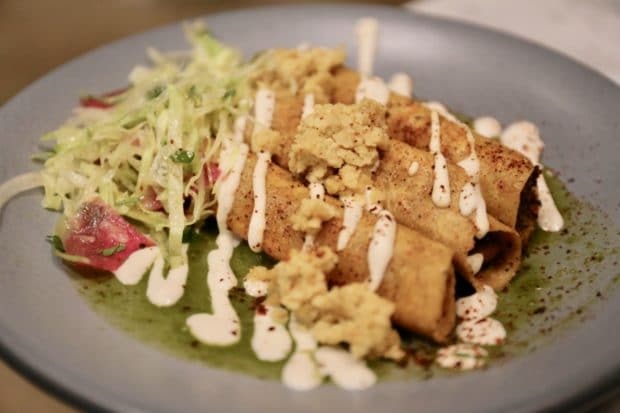 Toronto’s best vegan Mexican restaurant also offers a three course prix-fixe lunch menu from Monday to Friday. 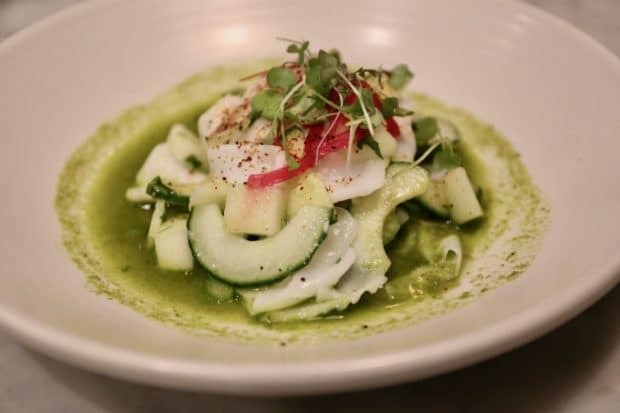 Chef de Cuisine Matthew Ravenscroft presents a healthy lunch menu that focuses on quick, wholly satisfying lunches – that also happen to be vegan. The $23 prix-fixe menu allows power-lunchers in downtown Toronto to choose from a diverse set of vegan dishes. Rosalinda’s eye-popping interior and segmented spaces offers the perfect venue for cocktail receptions, bridal and baby showers, engagement parties and corporate events. The restaurant can accommodate private bookings for 20-270 guests, with a seated capacity of 140 people. With its open concept, multiple banquet areas, and marble-topped bar, Rosalinda Toronto offers an unforgettable space. For Toronto couples looking to share their nuptials in a jaw-dropping restaurant, Rosalinda can host an on-site ceremony for up to 150 people. If you’re looking to host a meat free party Rosalinda is one of the best vegan restaurants in Toronto to celebrate!